Does anyone else remember the exhausted but dedicated Dunkin Donuts man from 30 years ago? I’ll admit that right now I’m tired and actually somewhat relieved when I spot a thieving squirrel running the fence with a Roma snatched from the one of the few remaining plants. Don’t take this the wrong way; we really do enjoy the fresh harvest we’ve been consuming every day of the last few months. However, the 2/3s of each day’s harvest that we don’t eat is what is wearing me out. 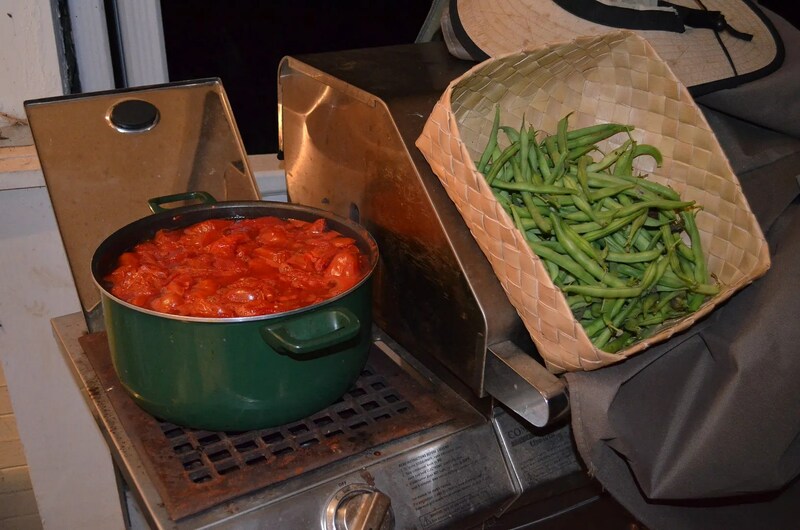 Picking, cooking, blending, blanching, canning, freezing- almost every evening lately has involved at least half of these activities. Over the winter and into spring I know I’ll be glad for the August evenings and weekends spent running between the garden and the ,but…. Actually when you push things like this you develop systems to juggle things more efficiently. 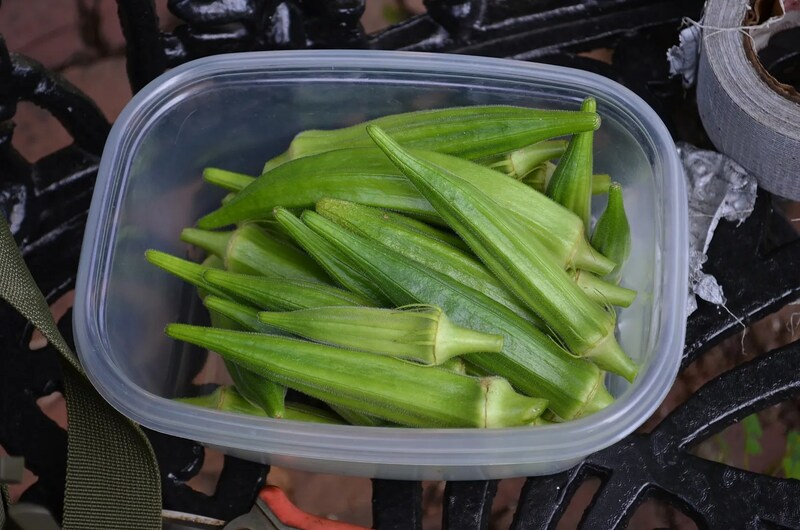 Cut the okra every day for a steady daily harvest (most of which is roasted and eaten right away). Okra harvest is a good warm up even with just a dozen plants; you get to stand up straight and snip at eye level in August but is it hot and itchy just the same. Harvest Tomatoes en mass every 3 days or so, one night cook them down whole (either in a pot or roast), refrigerate overnight, then mill and finish cooking/canning sauce, paste or soup the next night. Once or twice a week slice them in half and oven dry 3 or 4 trays overnight at 190 degrees and freeze in the morning. Pick snap beans one night, limas the next, take a day off and repeat. Thank mrs cohutt for shelling the limas. It’s hot work and I’m outside anyway so I’m now cooking the tomatoes down on the gas side burner of the grill. Pick beans, return the the porch, stir. Repeat until beans are picked; check for peppers. Return to the porch, stir. Get distracted by a dang bug or bird or something and waste 10 minutes trying to get a picture or just watching it. Come in for a water break. Find out which tomato was bruised or punctured when you brought it in to ripen 3 days ago (follow your nose to the sun room, one of the 150 out there at any given time has gone stealth-funky) and give it back to nature. Take a break and let paranoia force you to check the CDC website AGAIN to see if West Nile has been reported in any contiguous counties yet this summer (it hasn’t, the closest is Cobb county 40 miles south, 2 cases). Go back out to try and finish a thing or two and listen to the thunder rumbling closer as the sun sets. Come inside, change out of your sweat soaked clothes. Wipe down and label yesterday evening’s jars of soup and paste. 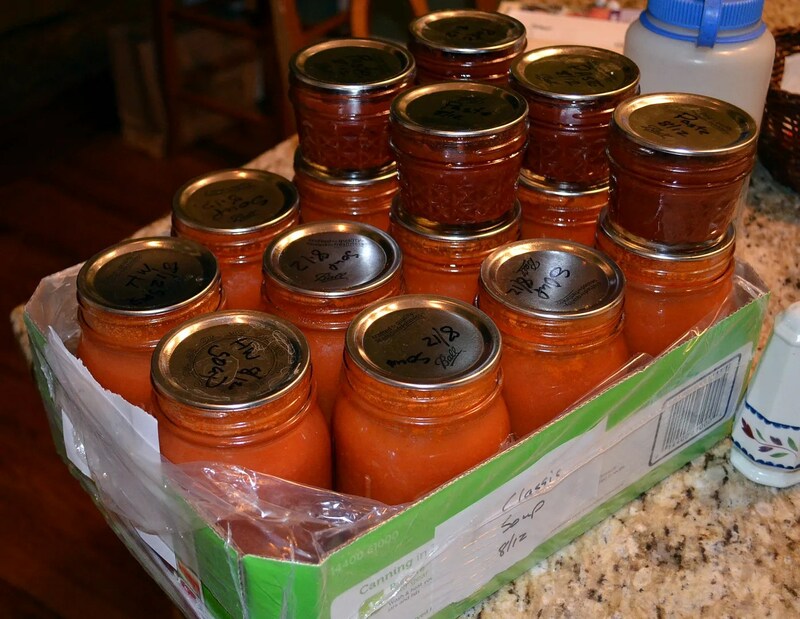 Bring in the pot of Romas and cool in the sink in ice water before moving it to the fridge for the night. 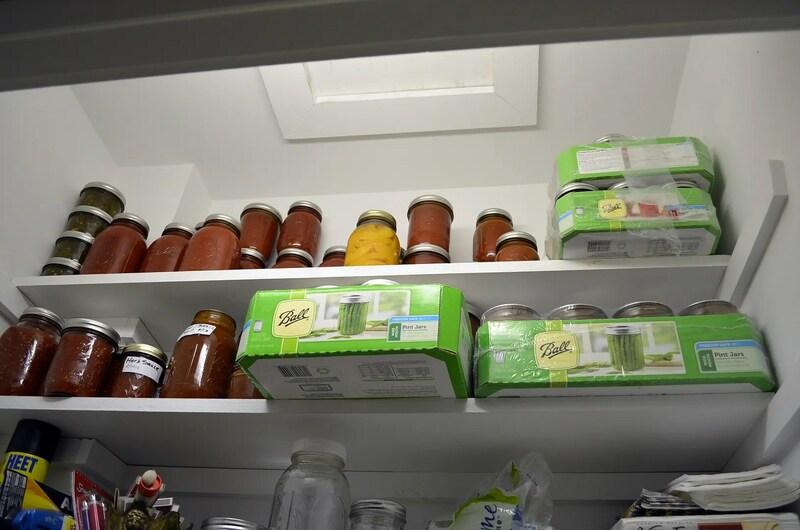 Look into the pantry to find a spot for yesterday’s work. Discover there isn’t room and leave them on the counter for the elves to put up later. Scoop a cup of vanilla ice cream and crash into a soft chair on the porch. Try and type out a blog post that starts out with a whiny pity seeking tone but ends in self satisfied smugness. Recklessly decide it is too damn late to do any serious proofreading of the post.